What's On / Bristol Gigs / The Old Market Assembly / New Years Eve - Big Top Bonanza! New Years Eve - Big Top Bonanza! Roll up, Roll up... this New Years Eve view the spectacular, enjoy the theatrical and experience the show! 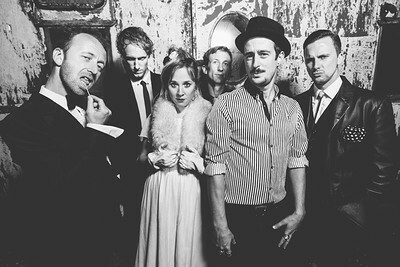 The Carny Villains are bringing their stomping ska, swing and Balkan-style folk, and amazing stage show, New Years Eve has never been so wonderfully dramatic! Playing some good 'ol crowd pleasers, Mista Trick will start the show before returning for the late slot with his vintage, vaudeville vibes nad down and dirty drum n bass. The beautiful love-child of a wartime knees-up and a 90s rave. Bring dancing shoes! AND WHAT'S MORE? For a limited time, early bird tickets are just £10! (£15 thereafter). With acrobatics to marvel and burlesque to indulge, step up, step in and let the New Year begin!